1. Melt the butter with oil in a large Dutch oven over medium/high heat. Stir in the flour and cook stirring constantly for 5 minutes or until caramel colored. Add the onion and next 6 ingredients. Sauté for 5 minutes or until vegetables are tender. 2. Add the chicken broth, parsley, and chives. Cook stirring constantly for 5 minutes or until mixture is thick and bubbly. 3. 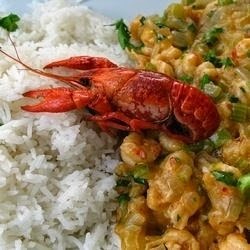 Stir in the crawfish and cook for 5 minutes or until thoroughly heated. Serve over hot cooked rice.